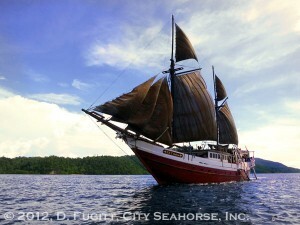 Our Liveaboard Dive Ship – Comfortable – Exotic! Build for Diving! I run this trip every year at just about the same dates – it’s normally either an invitation-only trip, or is filled with repeat guests. This year my Most Popular Trip is available to you. Only 2 spaces remain. Double occupancy only. In 2016 this trip is a private charter. 17 crew for 12 guests including 4 super-experienced, hand-picked dive guides. We’ll dive with Manta Rays and spend most of our trip diving the best of South Raja Ampat for the world’s best reef diving. See trip dates on the website: dates, prices, inclusions.